All of the resurrection stories depict the Apostles and other disciples on a journey of sorts to understand the resurrection. A completely new reality was breaking into their world and challenging their understanding. Far from depicting the disciples as credulous, the texts describe them as shocked, troubled, and even quite dubious. These were not men and women prone to naiveté or to concocting stories to assuage their grief. They are quite stunned by a new reality and struggling to get their minds around something they do not fully understand. 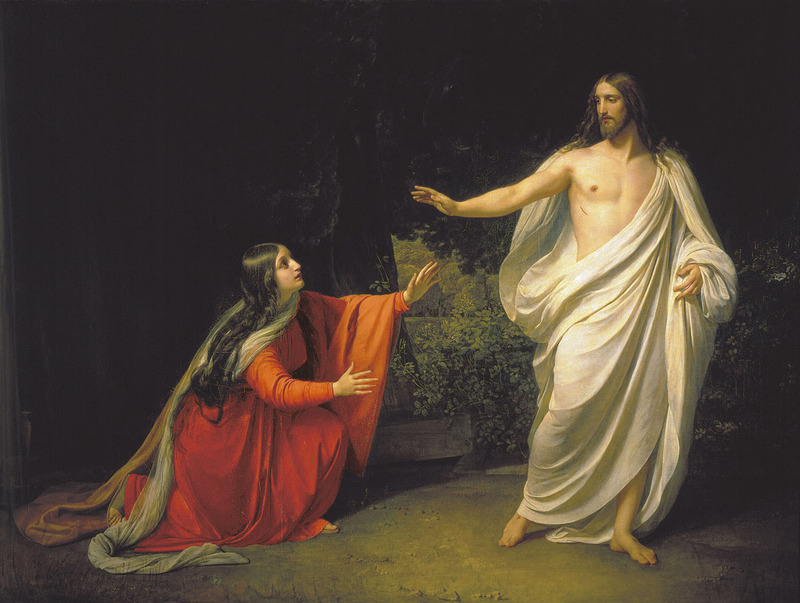 A beautiful example of a journey to resurrection faith is that of Mary Magdalene, who begins her journey on resurrection with the intention of finalizing burial rituals for the corpse of Jesus, and ends by acknowledging that she has seen “the Lord.” Let’s examine her journey as described in the Gospel of John, and see what it has to teach us about our own journey. Then the disciples went back to their homes. But Mary stood weeping outside the tomb, and as she wept she stooped to look into the tomb; and she saw two angels in white, sitting where the body of Jesus had lain, one at the head and one at the feet. They said to her, “Woman, why are you weeping?” She said to them, “Because they have taken away my Lord, and I do not know where they have laid him.” Saying this, she turned round and saw Jesus standing, but she did not know that it was Jesus. Jesus said to her, “Woman, why are you weeping? Whom do you seek?” Supposing him to be the gardener, she said to him, “Sir, if you have carried him away, tell me where you have laid him, and I will take him away.” Jesus said to her, “Mary.” She turned and said to him in Hebrew, “Rabboni!” (which means Teacher). Jesus said to her, “Do not hold me, for I have not yet ascended to the Father; but go to my brethren and say to them, I am ascending to my Father and your Father, to my God and your God.” Mary Magdalene went and said to the disciples, “I have seen the Lord”; and she told them that he had said these things to her (John 20:10-18). Mary Magdalene makes a journey in this passage from fear to faith. Let’s prayerfully examine her journey of faith. I. Her Fearful Fretting – Mary Magdalene is looking for a corpse. She’d come out to the tomb that morning for one purpose: to finish the prescribed burial customs for Jesus. His body had been placed in the tomb hurriedly on Friday evening, for it was almost sundown and the Passover feast was near. Now the Passover and Sabbath were complete; it was time to anoint the body and finish all the usual customs. On Friday, Mary had been through immense trauma, seeing her beloved Jesus, her Messiah, brutally tortured and slowly killed through crucifixion. It seemed as if things could not possibly get worse, yet they just did. It would appear, according to her, that grave robbers had broken in and stolen the body. Strangely, they had left the expensive linens behind. But never mind that, things were now a total disaster. Now it would seem that she could not even perform a final kindness for Jesus. Because of her fearful fretting, Mary is not able to look at the information before her properly. Jesus had promised to rise from the dead, on the third day, and this was the third day. The empty tomb does not signify grave robbers; it manifests resurrection! In her fear and fretful grief, though, Mary draws only the most negative of conclusions. This, of course, is our human condition. So many of us, on account of fear and perhaps past trauma, tend to place the most negative interpretations on the events of our daily life. We are quick to seize on bad news, and we dismiss good news too easily, or barely notice that every day most things go right. Instead, we focus on the few things that go wrong. So easily we are negative and forget that even in painful transitions, as certain doors close, others open. New possibilities often emerge even in painful circumstances. Mary is about to encounter something astonishingly new, but for now, her grief has locked her into only the most negative of interpretations. A. Rhetorical Question – There comes to her, from the angels, a kind of rhetorical question: “Why do you weep?” A rhetorical question is really more of a statement in the form of a question. It is meant to provoke thought and to rebuke, or at least to invite reconsideration. The angels, it would seem, are inviting her to recall that this is the third day and Jesus promised to rise. Therefore, why would she weep over an empty tomb? Jesus, who had raised others from the dead, cast out blindness, calmed storms, and healed lepers, had said that He would rise on the third day. Why weep over an empty tomb? Rather, she should rejoice! Grief does that. It takes away our capacity to see more clearly other possibilities, other interpretations. So easily we turn things into catastrophes in our mind; we assume the worst. Mary is at her lowest, locked into fearful fretting and colossal grief. II. Her Faulty Finding – The text says, she turned around and saw Jesus there, but did not know it was Jesus. Jesus speaks to her: Woman why are you weeping? Whom are you looking for? Mary thought it was the gardener and goes on speaking of Jesus as a corpse she is looking for. Why does she not recognize Him? Has He changed his appearance? Or perhaps there were tears in her eyes and she could not see well. We cannot say, but either way, she’s looking right at Jesus but does not recognize Him. Too often, this is our condition as well. The Lord is more present to us than we are to ourselves; He is more present than anyone or anything in this world. Yet we seem to see everyone and everything except Him. This is our spiritual blindness. We must make a journey in faith and learn to see Him. We must come to the normal Christian life, which is to be in living, conscious contact with Jesus at every moment of the day. Does the sun cease to be present simply because the blind man cannot see it? Of course not. Neither does the Lord cease to be present to us simply because we cannot see Him. We must make the journey of faith wherein our eyes are opened, the eyes of our faith to see God’s presence everywhere. III. Her First Faith – One of the paradoxes of our faith is that we learn to see by hearing. For Scripture says that faith comes by hearing (Rom 10:17), and faith is a way of knowing and seeing by way of that knowledge. Jesus speaks and says “Mary.” With this, her faith is enlivened; her eyes are opened and she recognizes Jesus. We, too, must allow the Lord to speak to us through His Word, so that we can learn to know Him and to see Him by faith, not by fleshly sight. However, Mary’s faith is only a first faith, an initial faith. It needs maturing, as we shall see in the next point. IV. Her Fuzzy Focus – Having come to recognize the Lord Jesus, Mary initially wants to smother Him, to cling to Him. Her excess is not merely physical, but bespeaks a kind of clinging to the past. While it is true that the actual body of Jesus is risen and restored to her, the humanity that has been raised is a glorified humanity. There is something new that Mary must step back and behold. A. Status quo ante – Thus Jesus says to her: Do not hold me. That is, “do not cling to me.” Mary’s gesture of embracing the Lord, and His reaction to it, suggest that something has changed that Mary has not yet fully understood. She clings to Him as He was. It’s as if to say, “Jesus, it’s you! Let’s pick up where we were before the crucifixion.” She thinks of Jesus of Nazareth alive again, but she must also now see the Lord of glory. His crucifixion has led to His glory. That is why Jesus speaks further of the fact that He is ascending to the Father. From now on, therefore, we regard no one from a human point of view; even though we once regarded Christ from a human point of view, we regard him thus no longer. Therefore, if any one is in Christ, he is a new creation; the old has passed away, behold, the new has come. All this is from God, who through Christ reconciled us to himself and gave us the ministry of reconciliation; that is, in Christ God was reconciling the world to himself, not counting their trespasses against them, and entrusting to us the message of reconciliation (2 Cor 5:16-20). For those whom he foreknew he also predestined to be conformed to the image of his Son, in order that he might be the first-born among many brethren (Romans 8:29). For it was fitting that he, for whom and by whom all things exist, in bringing many sons to glory, should make the pioneer of their salvation perfect through suffering. For he who sanctifies and those who are sanctified have all one origin. That is why he is not ashamed to call them brethren, saying, “I will proclaim thy name to my brethren, in the midst of the congregation I will praise thee.” And again, “I will put my trust in him.” And again, “Here am I, and the children God has given me” (Heb 2:101-3). Mary is further told that she should say to them, I am ascending to my Father and your Father, to My God and your God. V. Fullness of Faith – In this last stage, Mary makes a significant step in her journey. She comes to a fuller faith based on this interaction with the Risen Jesus. How? When she goes to the apostles, she says, I have seen the Lord. She does not merely say, “I have seen Jesus.” She calls Him “the Lord.” It is true that the term “Lord” could simply be a term of respect like “Sir,” but there seems to be a shift in Mary’s understanding. She goes from using the term “Lord” to refer to a corpse that has been taken and put somewhere, to simply and authoritatively saying, “I have seen the Lord.” That is, “I have seen Jesus, who is Lord and God. He is risen and is ascending, and He has given me a word for you endowed with plenary authority.” This is resurrection faith: to see the glory of Jesus and understand that He is the Lord of glory and the Word who is God. Christ Jesus, who, though he was in the form of God, did not count equality with God a thing to be grasped, but emptied himself, taking the form of a servant, being born in the likeness of men. And being found in human form he humbled himself and became obedient unto death, even death on a cross. Therefore, God has highly exalted him and bestowed on him the name which is above every name, that at the name of Jesus every knee should bow, in heaven and on earth and under the earth, and every tongue confess that Jesus Christ is Lord, to the glory of God the Father (Phil 2:5). Mary Magdalene has made a journey from fear to faith. She began by looking for a corpse to anoint. She ends by making the mature Easter declaration: “I have seen the Lord.” It is truly Jesus who is risen in the self-same body. But He is glorified and now shows forth fully the refulgence of His glory as the eternal Son of God and Son of Man. To come to Easter faith is not only to see Jesus of Nazareth raised from the dead, but even more so to behold that He is the Lord of Glory. Mary has made the journey. How about you? Why would Mary Magdelen go to the tomb for “final prep given that it was sealed off and physically inaccessible by all expectations ? I struggle with that supposition. How did she expect to gain entry to the tomb? Or, why is this question not important? Tom- don’t forget that there were guards at the tomb to prevent anyone from “stealing” the Lord. Saint Mary Magdalene – Pray for us.